We would be shocked if you weren’t at least a little worried about cyber terrorism and what it could do to your CPA firm. You’ve probably heard about big name companies like HBO, Anthem, Sony, Home Depot and Target being attacked. Beyond a nagging sense of worry in the back of your mind, what has your CPA firm done to build up the walls against cyber threats? The answer is probably very little. That’s because there is a sense out there that CPAs aren’t big hacker targets; especially the small to mid-sized firms. But that is the furthest thing from the truth. Cyber terrorists want data, and the information rich CPA firm is the perfect target for identity thieves. According to CNBC, companies with less than 250 employees made up 31% of the cyber terrorist incidents last year. If you’re not paying attention now, you might be in trouble later. This article takes a look at some of the cyber security issues facing CPAs during the 2018 tax season and what options you have to help keep your data safe. Get a free assessment of your current ability to withstand a cyber breach. Your firm’s insurance premiums could increase. Some firms have been buying cyber security insurance, unfortunately, that’s usually after they’ve been attacked. The article explains that it isn’t uncommon for policy premiums to rise 200% or more after a data breach. The loss of reputation with customers is one thing, but your credit rating can be lowered after a cyber target. It happened to Target in March 2014 and it can happen to your firm as well. Financial repercussions could include loss of customers, or, in the case of ransomware, actual shut down of your company operations and loss of data. How can accounting firms protect their company and their clients from the risks inherent in today’s digital environment? The answer is to work with an IT security expert to keep your firm safe. Managed service providers are a great option for even the smallest CPA firm. How Can a Managed Service Provider Keep Your Firm Safe? Business Continuity and Disaster Recovery Planning that helps analyze and create a response plan should the worst happen, whether it is a cyber attack, natural disaster or other incidents. Incident response management which includes identifying the threat and mitigating your risk by developing effective countermeasures to resolve the issue, get you back up and running, and seal the breach. Managed Network Monitoring that watches for intrusion with advanced detection technology. 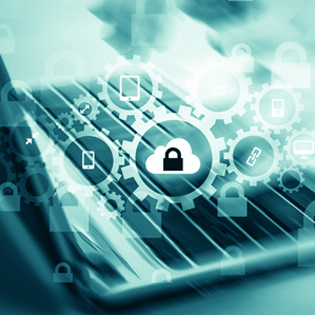 Firewalls, malware protection, encryption, and other tools help a managed service provider protect your network – even when you’re not using it. A managed service provider typically provides these services as a monthly subscription service, which makes for a budget-worthy line item each month. In addition to monitoring your computer network, they can set up security controls on cell phones or other digital devices. They can provide training to help your staff understand the difference between a real email and a phishing scam. They can also suggest equipment upgrades, apply automation to streamline your workflows, and much more. As you’re beginning to prepare for 2018, you owe it to your firm to take IT security threats seriously. A managed security provider can assess your current technology infrastructure and apply software patches for security, monitor for cyber breach, and create a plan for mitigation. A managed service provider offers a real partnership to help keep you, your employees, and clients safe. Request a quote on managed security services today.